Fillip and Motto Berlin are pleased to present a special launch event for the sixteenth issue of Fillip magazine with contributing artist Olaf Nicolai, writer Patricia Reed, and Fillip Associate Editor Antonia Hirsch. Colour is a major factor in a magazine’s “shelf appeal” and Fillip magazine, though a publication more aligned with academic journals, has more than a few times been advised to “go colour” in order to facilitate a larger sales volume. Olaf Nicolai’s project for our new issue, 2500 × Fillip 16, subverts this market pressure by causing the magazine to be printed in colour—yet this application of colour is undelineated and flows across the spectrum of the rainbow as well as across the page regardless of the printed content. The printing technique used to achieve this effect is called split fountain printing; with a history that stretches back to the inception of the art of printmaking, it gained renewed currency in the 1960s and ’70s as a method to introduce colour in printed material without having to go through the expensive four-plate colour process. With its evocative, quasi-psychedelic effect, the technique was particularly popular in a countercultural context. Olaf Nicolai’s project for the Intangible Economies series extends the artist’s existing research interests, previously explored in such works as Warum frauen gerne stoffe kaufen, die sich gut anfuehlen (Why women like to buy fabric that feels good to the touch) (2011), and Considering a Multiplicity of Appearances in Light of a Particular Aspect of Relevance. Or: Can Art Be Concrete? (ongoing in varying formats since 2006). 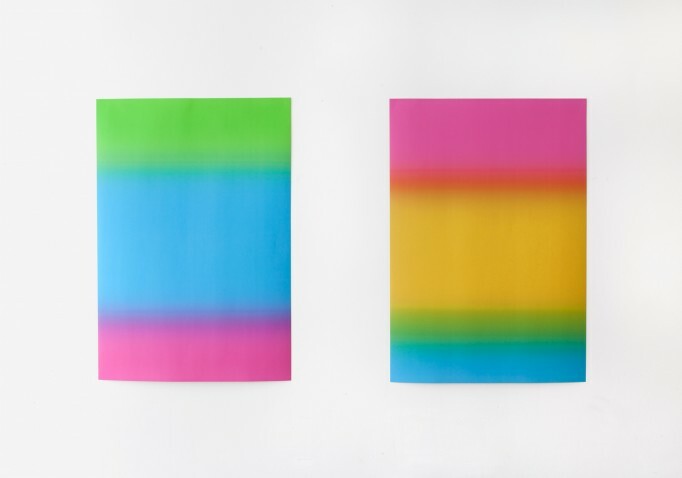 These works consider the role of colour as an agent to activate affect as a consumer incentive. Nicolai’s project for Fillip 16 also represents another instance of the artist’s ongoing infatuation with print media in general through which he consistently mobilizes production techniques in order to articulate conceptual concerns. The printing technique used in 2500 × Fillip 16 causes each single copy of Fillip magazine’s sixteenth issue to become a unique original as no printed copy is exactly like the other. Accordingly, the affective power of colour in relation to consumer behaviour is complicated by questions of value and circulation vis- à-vis the unique art object. Copies of the new issue will be available at the launch, as will Olaf Nicolai’s new Irisdruck edition, Fillip Poster One and Two, produced in tandem with Fillip 16. Olaf Nicolai is an artist who lives and works in Berlin. His work has been exhibited at documenta X, the Sydney Biennale, and the 51st Venice Biennale, as well as at the Moderna Museet, Stockholm; the Museum of Modern Art, New York; and the Kestnergesellschaft, Hanover, among others. Antonia Hirsch is Associate Editor at Fillip. This entry was posted	on Friday, May 25th, 2012 at 1:42 pm	and is filed under art, events, magazines, Motto Berlin event. You can follow any responses to this entry through the RSS 2.0 feed.